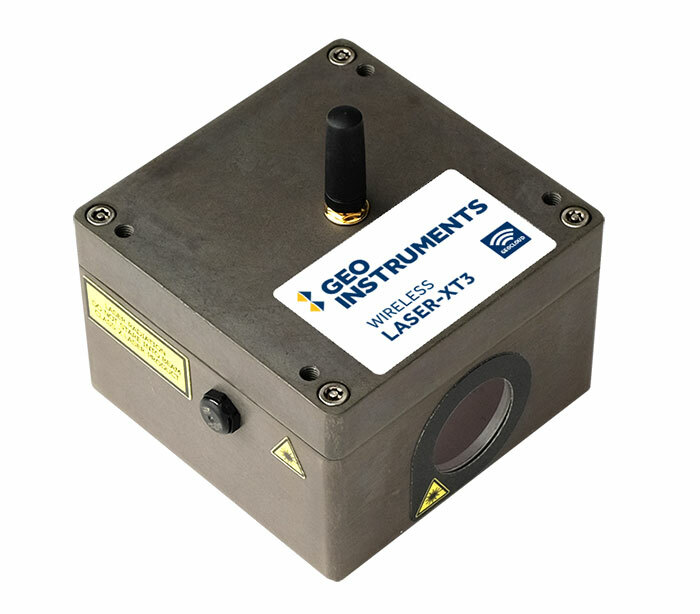 The Laser-XT3 provides high-precision distance and tilt measurements. It is one of a new generation of efficient, battery-powered, radio-equipped, digital sensors. Monitoring pillars, bridge decks, retaining walls, tunnel profiles for deformation or movement. Monitoring structural movements at locations that are difficult or dangerous to access. Monitoring rotation with its built-in 3-axis tiltmeter. Remote displacement measurements: The Laser XT3 works with natural surfaces up to 165 feet away and with targets up to 500 feet away. Built-in Tiltmeter: The built-in tiltmeter provides high resolution tilt measurements. Easy Installation: The compact Laser XT3 easy to install and requires almost no maintenance. Cable-Free: GeoCloud sensors provide their own power and transmit measurements by radio, entirely eliminating the cost of cables, cable protection, and cable maintenance. Sensor: Laser Class 2, 655 nm (visible red). Range: 165 feet from natural surface target, 330 feet from white target, 500 feet from reflective target. Sensors: MEMS tilt sensors in three axes. Range: ±90° in each axis. interval, 8 years at 30 minute reporting interval, including acting as a relay. Environmental: IP68 at 1m for 24 hours, -10°C to +50°C for full functionality of laser, -25 °C to +85°C for tiltmeter. Dimensions: 3.5 x 3.5 x 2.4 inch high.